Bloggerette Extraordinaire. Blogging the stuff in her brain one blog post at a time. Full review on my blog. I am a big fan of historical fiction. I utterly enjoy reading stories that take you back in time to real places and historical events. There’s something magical about romancing past lives. It feels like all the suffering and horrors of the past can be rectified or somehow honored with historical fiction stories. Sadly as a reader of this genre, I am often deceived by publishers who in an effort of trying to get religious messages out there, abuse historical fiction readers by not mentioning the fact that the stories are religious fiction. When I saw the title and cover of this book I knew I had to read it. But you know what they say, never judge a book by its cover. 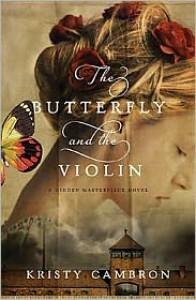 The Butterfly and the Violin is the story of Sera James and Adele Von Bron. Sera’s story takes place in our present time. Adele’s story takes us back in time to Austria in the 1940s. I was very pleased as I started reading this book. The first 7 chapters were entertaining. I liked the parallel stories. Sera and Adele were two characters with whom I could easily relate to. They felt real and their stories felt credible. When I reached the Auschwitz part I knew I was in for an emotional ride. Forty percent into the book was when my first red flag appeared. I was misled by not knowing this was Christian fiction. But the religious statements at this point were small and subtle so I let them pass. But sadly as charming as William was with Sera and as compelling as Adele’s time in Auschwitz was, the love stories ended up being too PREDICTABLE for my taste. Yes, the capital letters are intended. The historical facts around them were promising and captivating. Anything you read about the Holocaust has emotional power. The author had a story that had romantic tear-jerking potential but it lacked that dramatic effect and left me waiting for it to come. And the final turn off for me was that from approximately page 230 until the end, it got really religious which was something I hadn’t signed up for; nothing in the blurb of this book said religious fiction. In the end I felt like the author focused too much on Sera and used Adele as a historical filler. It should’ve been the other way around. Adele’s story was much more interesting and would’ve liked this book better if it had been only about Adele. I wanted to know more about Adele in the end, but the author focused so much on pouring the religious messages that Adele’s ending felt rushed and wasted. With that said, this book is an OK read, 2 stars it gets, nothing more. If you’re into holocaust fiction this is not the book for you. There are better options out there. If you are looking for religious fiction, then this might be the book for you. Can’t say if it’s good religious fiction or bad though, that would be for fans of this genre to say.